A rustic boathouse on the water's edge has been converted into a lovely cottage, suitable for families, couples or a singular retreat. The boathouse is about 80 years old and has a lot of character. The terrain is sloped with the living area, build in kitchen and wood stove at the lower water level; the three bedrooms and bathroom are at the upper level, which has a wrap-around porch as well. The floors are connected by interior and exterior stairs. The main entrance is at the upper level. The big sliding doors allow you to use the outside area easily and walk up the pier any time you want to. The surroundings, the tranquility, the stars at night, the slow ever changing movements of the water, it is all there for you to enjoy. You can stroll the small beach at low tide or climb the rocks around it. You can even bring your canoe and launch it right at the house. Shore birds, seals, ospreys and wild turkeys. Nearby a bed and breakfast that also serves as a fine restaurant serving locally sourced seafood, meats, and produce picked fresh from the farm. A mere short drive from Damariscotta and Wiscasset, which is known for the best lobster rolls in the state. Close to Reid State Park and Popham Beach State Park. Please be aware with small children that the house is at the water. We are a Dutch/American family. Many years ago my husband and I lived in Norfolk, Virginia, where we studied and worked for several years. We moved to Boston where our daughter was born. Our two sons were born in Amsterdam and we live there still. As a matter of fact we live in Amsterdam right at the water as well. With our boat we visit the canals all the time. As our daughter went to Brown's, we traveled the United States again and rediscovered it once more. We totally fell for Maine, and were lucky enough to have found this perfect spot. My husband works as an architect and I am a landscape architect and work for the city of Amsterdam. 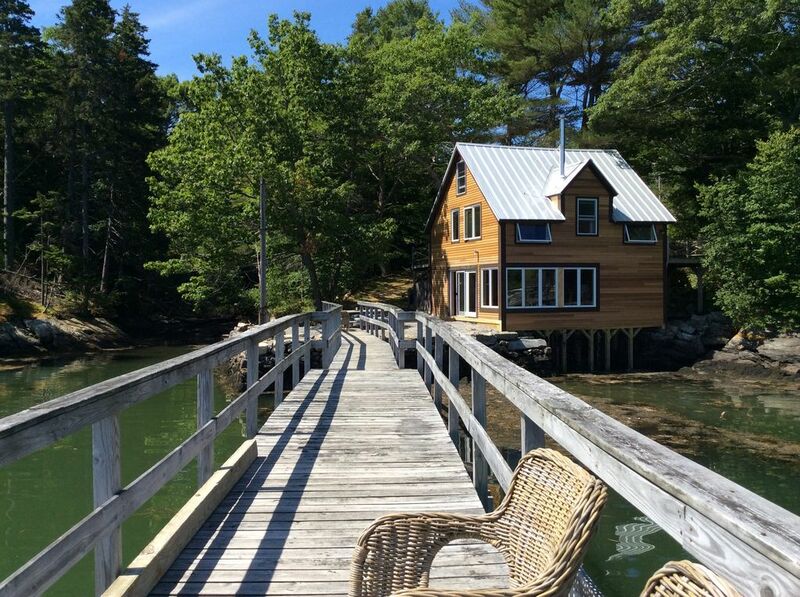 We hope to visit Maine as often as we can, as it is a lovely place to be, and in the meantime it's available for rent. We think this house is just perfect. It's right at the water and has lots of charm. The area around it with the terrain a litle sloped is great for exploring. You can sit on the grass in the sun, pick blackberries in August, walk the beachline, fish at the pier or just sit with a book. We love the area, the 'outdoor' feeling, the closeness to small towns, to beautiful parks with beaches and lots more! It's a wonderful place to be away from it all. The rooms are comfortable and cozy with great views at the water or the outside. The character of the house and its unique location make us feel at home immediately every time we're here. Bathroom with shower and watercloset; view over the water and pier. Separate heater. Internet was installed in 2017; it works extremely well. How could one not appreciate this unique location and beauty of this converted boat house ? This was the perfect time for us to visit, as the quiet and beauty was what we needed. Caroline is the perfect hostess, attentive and responsive. All that one needs for a short vacation in this month was here. One may travel if they wish or just sit and enjoy the home and pier. The wood stove adds so much to the atmosphere and warmth. No TV is a good thing we felt. Summer would be a different environment , but we so enjoyed this time. You should reserve your time here ! This was our third time at the Boathouse, we obviously love it! It’s location right on the water and the house itself are just perfect. We are already looking forward to returning. Without sounding too hyperbolic, this place is magical. In a single day, we saw dolphins swim by and a bald eagle land atop a tree less than 50 yards away. The boathouse is so peaceful and relaxing. You can build a fire (inside or outside) and simply watch the tide come and go. The master bed (the only one we slept in) was comfortable, the kitchen had everything we needed, the bathroom was roomy and perfectly appointed. There are puzzles, games, books, CDs, a canoe. Cute towns and grocery stores are a short drive away. We would love to spend more time at the boathouse cottage. My husband and I and our 2 year old son loved our time at the Boathouse! The property is perfectly perched at the shore and we particularly enjoyed the canoe which we took out every day. It was hard to tear ourselves away from the comfortable wood stove and views each day, but we also took advantage of outings in the area--hiking on Westport, Damiriscotta's Pumpkin festival, and the fantastic Coastal Main Botanic Gardens in Boothbay. Would be happy to stay again in the future. Had a very relaxing weekend here, beds were comfortable, wood stove and ambiance was great, sitting on the dock or by the fire pit and observing the wild life and boats occupied most of our weekend. September is an excellent time of year here, no crowds and it felt like we had the island to ourselves. Went on a great walk at Thomas point with the dog. It can be foggy at this time of the year. Easy ride to scenic boothbay harbor. The boathouse is only 20-30 minutes away from Wiscasset and Damariscotta, two beautiful historic towns with many antique shops and art galleries. Quaint little restaurants, ice cream parlors and small shops to browse. Wiscasset's famous Red's Eat! Lobsters! Bath and Brunswick, two other nice towns, only 30-45 minute drives. Bath: farmer's market each Saturday, Brunswick's Fleamarket during the weekends. Closerby: Montsweag's flea market. Camden (shops, antiques, golf)and Rockport only 1 hour drive. Boothbay: whale watching, eating lobsters, strolling along the harbor. Beaches and more nature: Reid State Park or Popham Beach State Park at 30-45 minutes drive. We provide free use of our membership card. Linens and towels are included except beach towels. We provide two towels per person. Cleaning fee is $100, linens and towels $50. Please contact me by email if you have any questions at all about the property or the terms. Rental stays during wintertime or early spring may have to be changed in case of periods of frost or hazardous winter conditions. In such a case we will offer you another time period or a refund. We live abroad so email is the best way to contact me. I will answer promptly, please be aware of the time difference; Europe is 6 hours ahead.